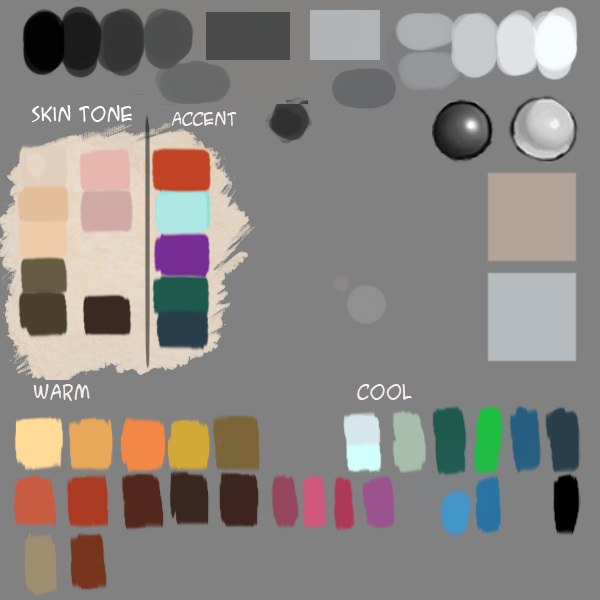 Make custom color palette for digital painting. This tutorial shows you how to create a color palette in Photoshop to increase workflow for digital artists. The tutorial shows you how to make different kind of palettes to suit your need. You can scroll down further to my personal palette. Color palette is really important in conceptual design. It can invoke your emotion in many ways. Color has effect on your mood. You can use selective color to communicate with the audience. Most cool color family will calm you down. If you use more intense color in the warm side you use, you can create sense of excitement in action scene. Q: I was wondering, in your Photoshop tutorials you have this palette thing; what is that? I could really use it. Is it a download or what? Q: I was also wondering how you made your little palette that I see you use in all the tutorials? Q: I also noticed you often have a color palette at the edge of the screen and wondered if you could talk a little bit about how you go about setting that up. A: This video tutorial will show you guys how to make Palette. It is just a layer in Photoshop that I made up for my own reference. If you are using photoshop for digital illustration, manga, anime and comics then watch the tutorial. If you use custom color palette in stead of HSB scale, it will save you a lot of time when painting. Here is a Color Palette for download and you can tweak them as you like and make them however you like. The way I made it over here is very similar to my traditional oil painting palette I use. What I have here are useful for gray scale because I have from white to gray to black so that I can easily pick the actual value I want. The I have blobs of my favorite to use skin-tone and its accent. And I have in the bottom, the color that I use most goes from warm and cool on each opposite end. Right click to “save” the palette. Q:I am getting better, but I am bad at making life like poses. They’re all stiff. A: As for poses you can practice drawing many many times from life model (street, train, coffeeshop, or college or private art local life-drawing session)…you have to be quick and do a lot. Don’t be discorage drawing from life, it takes time to perfect. Just keep up the drawing and you have to enjoy the process and learn from it. Or from reference pic. Process is the key once you nail it down the result will follow. Q: And how do you make such straight lines? A: use your should or elbow as a pivot point when you draw, not your wrist. Practice using big arch of your body to draw line, straight, curve. Also be decisive and stable when execute. Practice make perfect! Q: So would it be possible to include an art gallery of static images of your work? A: Yes, I could do some. Though most of the quick sketch I do for 5 mins tutorial are not as pleasing for me to look at. 😛 I will post them as long as they live up to my standard but I will post them more. Q: Oh and one other thing, would you mind posting some of your artwork in a JPG format of some bigger size? Thank you so much for these tutorials. They definitely help me fill in my knowledge gaps with Photoshop, and they are always inspiring! No problem, thank you kindly. Hmmm – the video for the palette tutorial doesn’t seem to be showing up? Tired it in Firefox and Internet Explorer but it’s not there. Yeah, she did use gouache/gauche paints as well. Some of those are damned expensive. Thanks! My mother was a water color artist (mainly, although she did do oil, acryilic and pastels) for 72 years, so the palette idea is a good one. Obviously, one can save a custom “swatch” in photoshop, but the little tiny color squares are less than fun to use. Ah, I see! Beginner in PS and just downloaded my first brushes from you, so I assumed this was a download for a custom color palette. My bad, thank you. it’s just that image, right click “save”. Are you expecting something else? I still don’t see the download link, can you repost it if you removed it, Xia? Thank you! Those are two separate window brother. DO NOT GO FULL SCREEN MODE. Dude, you can not, unless you make it the top layer. Hi Xia, I was wondering if you could tell me how do you mantain the palette window at front while you work in the principal window. I tried all modes of Arrange menu, but every time I click in my main image, the palette dissapears behind. Thanks. Right click and save. Please read the post. Where is the download for the palette? Yes, I do it as if it were traditional medium. Faster. Both are background color with cool and warm property depending on which you want to start from. I wonder the same at the first time when I saw that palette compressed in the tutorials, but I think it’s for color picking, isn’t it? 🙂 And yes, you’re right, it makes me easier to pick colors! But I still confused about two squares on the right (the cream and gray color), what are they?